Thrilling Activities to do in Mount Abu, Rajasthan. Mount Abu being the only hill station surrounded by the green environment is amongst the favorite destination for all tourists encounters many adventurous things to explore. Many exciting activities are there such as camping, trekking, sightseeing and boating, which can be, enjoyed at any part of the time as always the temperature is low, and climate is pleasant to check out things. Adventurous Activities in Mount Abu are uncountable things that one can do and chase all their fears out and win over them. Mount Abu is a delightful camping hub to eyewitness the beautiful sight of nature. Enjoy overnight camping with your friends or families to take you away from your busy life. Camp organized in between huge bedrock and greenery environment, can watch stars at night and prepare tasty vegetarian food nearby bonfire set. With camping, you enjoy beautiful stargazing with naked eye or telescope and create your best memories. Best time to go camping is summer season. Nearby Lake and through Aravali range, you can set your tents and experience camping life. Various trekking and hiking option is available to spend a holiday with your loved ones. Places that you can have trekking are Toad Rock, Guru Shikhar, Utraj and much more. Almost you can find trails and camping places starting from Nakki Lake. Hiking observed at bailey's Walk, Craig's Path and Salgaon trail experiences the whole jungle's view. Best time to enjoy hiking and trekking in summer and winter season. Everybody needs to wear comfortable clothes and proper shoes to trek. A place where you get exciting games and adventurous activities. Many tourists gathered here and it is full of crowd place. It is a place full of energy and enthusiasm, guaranteed you would want to visit again. Activities such as Zipline, Zip bike, Water Roller, etc arranged here. Many tour guides and agents organize parties, picnic, and birthday celebration here. There are many varieties of rock formation available in Mount Abu where one can do rock climbing and explore the beautiful view of the lake as well as greenery environment and experience peace of mind. 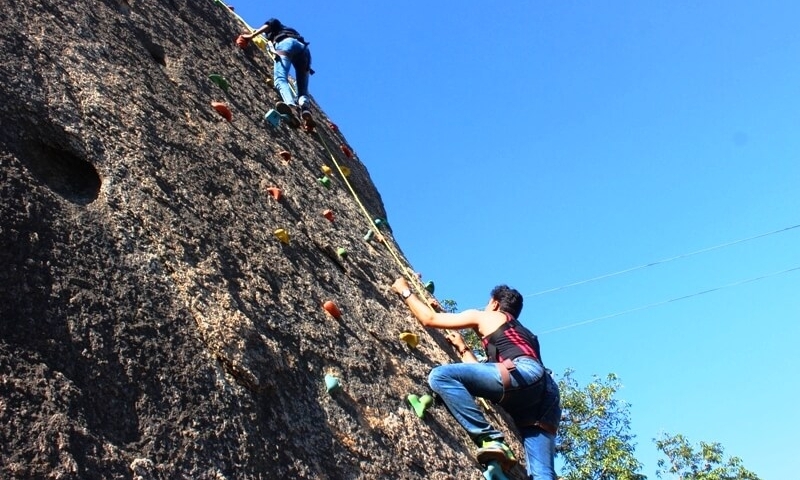 Best time to do Rock Climbing is summer and winter season. Wear comfortable clothes and proper shoes to climb the rock. 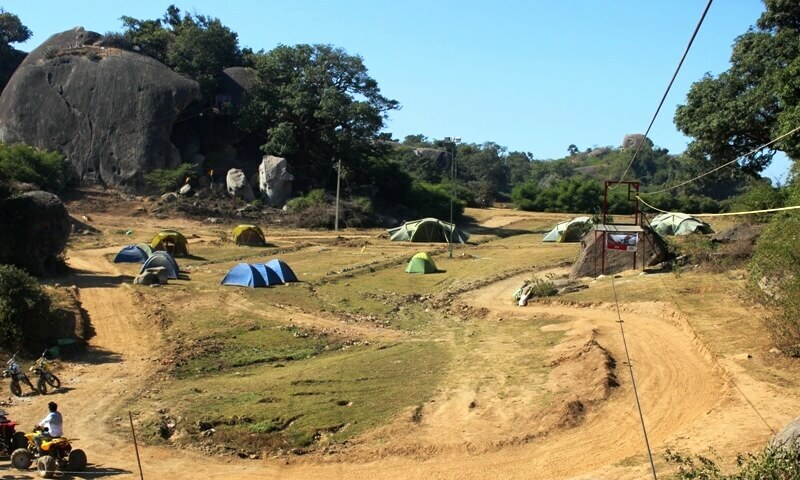 Most of the trekking and camping spots are nearby Mount Abu's famous Wildlife Sanctuary having abundant flora and fauna with all type of animals staying. One can opt for jungle safari tour, where they can explore greenery environment with watching animals. There are 200 species of bird and can watch birds in the morning and experience the peaceful atmosphere. Caving is one such activity in Mount Abu where one can cave into closer to waterfalls where you can enjoy adventurous activities. The caving site located near Dilwara Temples. Take a tour of entire Nakki Lake while doing sailing on a boat and experience the serene environment with pristine water view. One can spot many Ghats there such as Gandhi Ghats. Water Zorbing activities arranged into the Lake. The best time to visit is summer and winter season. There are different types of boat you can choose such as pedal boat and Shikhar Boat. Open hours of boating are from morning 6:00 am to evening 06:00 pm. Many of the hotels and resorts in Mount Abu, arranges adventurous tours for you in their packages. One of the luxurious resorts is The Humming Bird Resorts in Mount Abu gives you the experience of staying by creating soulful moments and avail all their amenities that make you astounding. It is located nearby all the adventurous spots so that less travel time taken and you can give more time exploring exciting activities.